ANDERSON: Bass fishing is good. Drop-shot soft plastics in 10 feet or less. Crankbait bite also works well. 408-463-0711. BERRYESSA: Water temperature in morning is 74 degrees. Kokanee have turned red. Anglers get small kokanee that are next year's class of fish. Some king salmon are near dam. Trout bite is decent. Bass are feeding on small shad, half the size of usual size. This might be last viable week of fishing. 916-502-3474. CALERO: Senkos and frogs are best producers. Best bass bite is in shallows. Spinnerbaits are a good bet. 408-463-0711. CHABOT: Catfish bite is best. Bass bite is slow and weather needs to cool for trout. Trout plant will go in next week. Best spots for cats are Half Moon Bay or Coots Landing. 510-247-2526. CHESBRO: Catfish bite is good with chicken livers or cutbaits. Many cats are 3 to 5 pounds. 408-463-0711. CONTRA LOMA: Fishing is slow. Best action is on catfish or crappie but bite is sporadic. 510-544-3154. COYOTE: It's tough fishing here. Try finding bass with Senkos, jigs or crankbaits. 408-463-0711.
three catfish per outing. Otherwise it's pretty slow. Trout plant went in this week. 925-449-5201. LAFAYETTE: Fishing remains slow. A few catfish get caught, mostly by those in boats in south end. 925-284-9669. LEXINGTON: Water is low. Only watercraft allowed are hand-launched boats. 408-463-0711. LOCH LOMOND: Lake is open weekends until seasonal closure Oct. 14. Trout have moved very deep and are tough to reach. Bluegill are fewer than last year, but there are pockets in shallow water. Bass staged a second spawn and a handful of 4- to 5-pound fish are being caught. 831-335-7424. LOS VAQUEROS: Striper bite is fair. Most are 22 inches or smaller. A 1,250-pound plant of catfish went in this week. Catfish are being caught every day, but nothing of bragging size. 925-371-2628. QUARRY LAKES: Trout fishing is very slow. Trout plant of 1,000 pounds was scheduled for this week. A few catfish are being caught. Boaters do best. 510-544-3133. SAN LUIS RESERVOIR: Pile worms, anchovies get stripers from forebay and main lake. Keeper stripers are starting to become more common but few have any weight. 408-463-0711. SAN PABLO RESERVOIR: Catfish bite is very good near boat launch. Bass bite is solid along shoreline across from boat launch and in preserve with plugs. Bluegill and crappie are plentiful near docks near boat launch. Trout bite is on slow side but a 5-pounder was caught near dam. 510-223-1661. SHADOW CLIFFS: Fishing remains slow. Best bet is bass fishing from float tubes in back lake. Use Senkos. Catfish will take chicken livers. 510-544-3230. 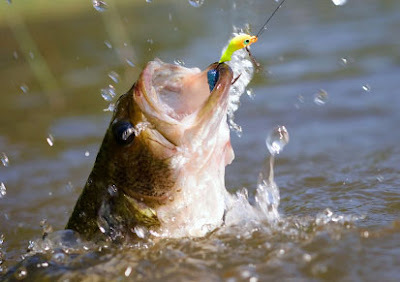 UVAS: Bass will chase spinnerbaits and buzzbaits but catfish are putting on best bite with cut baits or chicken liver. 408-463-0711. ANTIOCH: Striper bite is good from Antioch Bridge to Broad Slough. Some are catching stripers to 20 pounds. Most weigh less than 15 pounds. Mudsuckers, shad and sardines have been productive. Some are trolling with Hairraisers or Rattletraps or Yozuri Minnows. Sturgeon bite is showing life. Ghost and grass shrimp are best baits. A keeper was caught on anchovies from Antioch Bridge. Deeper water near West Island and Chain Island are best spots. 925-706-7400. BENICIA: Shore anglers at state park are catching 12 to 16 salmon per day. Best day this season has been 25 fish, but that's with a lot of pressure. Seals showed up at First Street and stole four salmon on Tuesday. Five were landed. Striper bite has life. Largest recently was a 37-inch bass caught on a bullhead. There are sturgeon at Big Cut and off Ninth Street. 707-745-4921. FRANK'S TRACT: Small schools of striper are in south end of Frank's Tract. Brown and purple or black and blue jigs get black bass. Topwater frogs work well. Bass are in tules, not edges. 925-625-2441. PITTSBURG: Salmon are being caught near PG&E plant with Blue Fox spinners. Stripers take bullhead in Honker Bay and Firing Line. 925-252-0151. RIO VISTA: Mike Tomasek and Kevin Saper caught two limits of salmon with largest weighing 22 pounds trolling with homemade spinners. Salmon bite has been steady but few have been out since Labor Day. Striper numbers are increasing. Trolling near bridge or Sandy Beach have been productive stretches. Most stripers are 5 to 7 pounds. Catfish bite is good off River Road and local docks. 707-374-2372. TRACY: All action is on shaker stripers. No report of legal bass of late. A 6-pound largemouth was caught last week. Action is sporadic. 209-835-3182. BERKELEY: New Easy Rider scored better than a fish per rod with five salmon larger than 20 pounds Tuesday. Island rock cod trips are planned for this weekend. Next albacore trip is Sunday. 510-849-3333, 510-223-5388, 707-334-4827. BODEGA BAY: Less than a fish per rod on salmon last week. Action is between Bird Rock and Elephant Rock. Rock cod limits are regular. 707-875-3344. CAPITOLA: White sea bass are in the area. Try fishing in 50 feet. Bass are chasing squid, anchovies and sardines. Squid are back near point. Salmon have been caught in the harbor. 831-462-2208. EMERYVILLE: Limits of rock cod and good numbers of ling cod go to island and local reef anglers. Last salmon trip was Sunday and boats scored less than a fish per rod. 510-654-6040. MONTEREY: There has been a white sea bass bite off Del Monte Beach. Party boats have yet to cash in. Rock cod/ling cod trips to Big Sur get limits. 831-375-5951, 831-372-7440. MOSS LANDING: The Kahuna on Wednesday came back with 10 albacore and an opah. 831-633-2564. PACIFICA: A few salmon are being caught from pier. Striper bite is fair from local beaches. Pier anglers get perch, jack smelt and shiners. 650-355-8303, 650-359-9790. PILLAR POINT: Local rock cod trips continue to come back with limits. Albacore boats are running 40 miles and getting fair scores. Most recent trip was Saturday on Connie O. Four anglers caught four albacore. Queen of Hearts has an albacore trip planned for Sept. 19. 650-726-7133, 510-581-2628. SANTA CRUZ: Albacore have moved offshore but it appears another band of warm water is moving from south. Local rock cod fishing is good. Fifteen anglers limited on Friday's half-day trip and 30 anglers limited on Sunday. Quality is good. 831-427-2334. SAN FRANCISCO: South Bay bite remains poor. Action is provided by sharks. Shore anglers can get perch. 650-589-3474, 510-703-4148. SAN PABLO BAY: Halibut fishing is good. Anglers are averaging better than a fish per rod. Best spots are Red Rock and Angel Island. Paradise and Southhampton are worth exploring, too. Striped bass fishing is fair. California City continues to provide sporadic salmon action. 415-456-0321. SUISUN BAY: Striper bite is good and range from 20 to 30 inches. Pier and Seal Island have been top spots. Bullhead and grass shrimp are best baits. 925-229-9420.